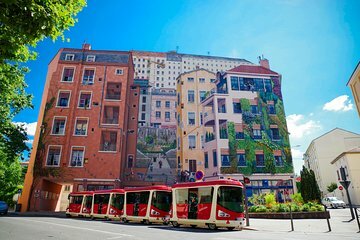 Explore Lyon’s hillside Croix-Rousse quarter by mini-train rather than foot on this city tram tour. Board the train with its panoramic windows and roof, and trundle through the village-like streets of this one-time silk workers’ district, famous for its boho atmosphere, markets, and wall murals. Admire the traditional townhouses and best-known murals depicting historical local scenes and figures, including the ‘Murs des Canuts,’ and ‘Fresque des Lyonnais.’ Multi-lingual audio guide included.